Nominated by William McKinley on May 18, 1900, to a new seat authorized by 31 Stat. 175. Confirmed by the Senate on June 5, 1900, and received commission on June 5, 1900. Service terminated on March 5, 1931, due to retirement. John R. Hazel papers, 1900-1967. 12 items; collection contains several manuscripts concerning the presidency of Theodore Roosevelt, Hazel's application and letters for a U.S. judgeship, material related to the Wright Company v. Herring Company case, and miscellaneous personal and family papers. 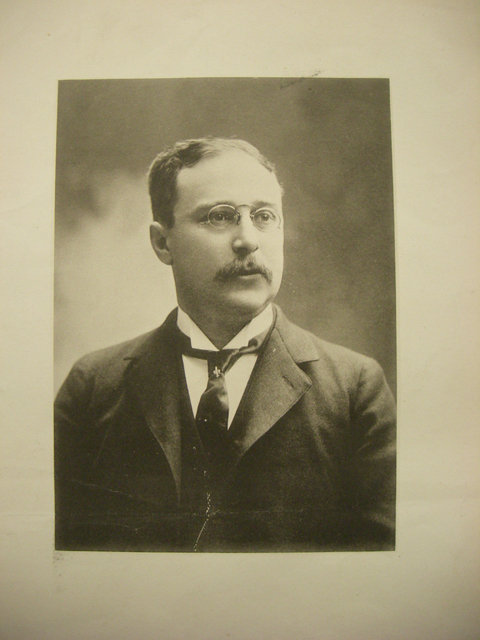 Judge John R. Hazel, head and shoulders shot; artist unknown; Photograph; n.d.; General Subject Collection, Research Library, Buffalo and Erie County Historical Society, Buffalo, N.Y. Reference image courtesy of the Buffalo and Erie County Historical Society. Further reproduction prohibited without permission of the repository. Judge John R. Hazel, seated at his desk; artist unknown; Photograph; n.d.; General Subject Collection, Research Library, Buffalo and Erie County Historical Society, Buffalo, N.Y.
Hon. John Raymond Hazel, 1900-1931; artist unknown; Oil on canvas; n.d.; Michael J. Dillon Courthouse; U.S. District Court for the Western District of New York, Buffalo.